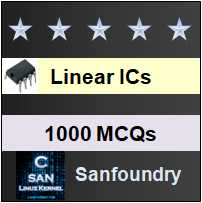 This set of Linear Integrated Circuit Multiple Choice Questions & Answers (MCQs) focuses on “Integrated Circuits, Types & Manufacturer’s Design – 1”. 1) What is the best choice of IC package used for experimental purpose? Explanation: DIP package are used as it is easy to mount. The mounting does not require bending or soldering of the leads. 2. What is the general information specified in ordering an IC? Explanation: Generally, in ordering an IC, all the three informations must be specified. 3. Find the ordering information for µA741TC. T represents Mini DIP package and C represents Commercial temperature range. 4. How a Motorola IC with plastic DIP and commercial temperature range is ordered? 0o to 70oc –> Temperature range (Commercial). Explanation: In National linear ICs, a 1-2-3 numbering system is used to represent the temperature range. 6. How does a industrial temperature range device in National Semiconductor IC is represented? Explanation: In LM201, the number 2 denotes an industrial temperature range device. 7. Use device identification method to find the IC of Fairchild chip manufactured in the year 1980. Explanation: DIP pack is easy to handle, fit standard mounting hardware and is inexpensive when moulded on plastic. 9. What is the use of notch and dot in DIP ICs? Explanation: A notch and dot as viewed form top view is used to find the pin terminal. The terminals are numbered counter clockwise. Explanation: An eight pin Dual-In-Line Package is called as Mini DIP as it is used for devices with minimum number of inputs and outputs.